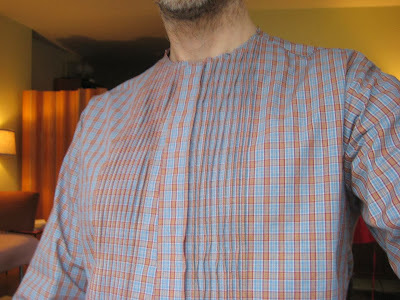 male pattern boldness: My UNDYEING Love for Rit Color Remover! 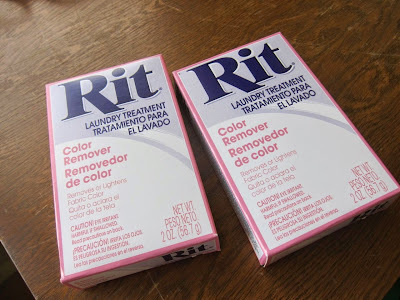 A number of you recommended I try Rit Color Remover after yesterday's fiasco, and try dyeing my shirts again. I happened to be near the Garment District today and was able to pick up two boxes of the stuff. I'm so glad I did. 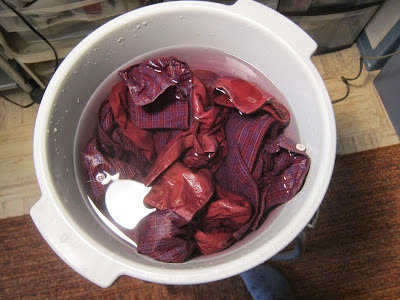 The directions were pretty simple: I heated a big pot of water to simmering, added the powder, presoaked the shirts and then added them to the pot. Each was in about fifteen minutes. They were subsequently rinsed (a lot) and will be machine washed tonight. 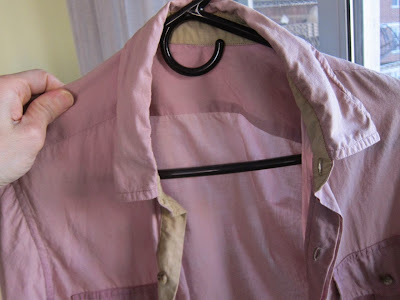 I did each shirt separately and stirred constantly with a pair of tongs. 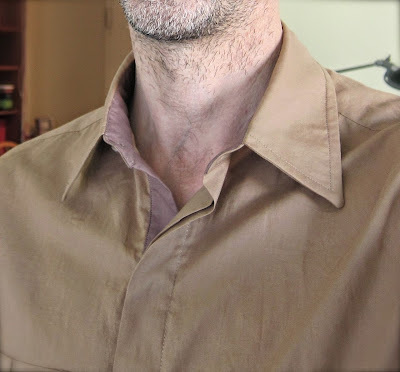 Right away I noticed that the contrasting purplish collar stand on what had been the solid beige shirt faded to a nearly identical beige, while the beige-dyed-maroon(ish) faded to a pale beet, for lack of a better term. It subsequently dried to this; no streaks or blotches, I'm happy to say. 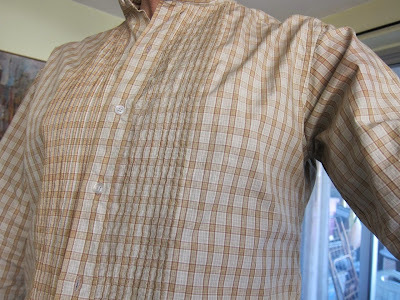 On the plaid shirt, the blue faded to gray and the orange faded to cocoa brown. Yesterday's fuchsia is, thankfully, history. Which yesterday looked like this: blotchy. I may try dyeing once again, but perhaps this time with Rit dyes, which seem a little easier to work with; I could see myself dyeing both a denim blue. Or maybe I'll give the Procion dyes another go, but one at a time, for longer, and with much more stirring. As much as I tried to convince myself I could pull off that Wabi-sabi effect, I would never have worn those shirts the way they looked after yesterday's experiment. Now, at least, they're wearable. Thanks for all the useful information you provided; I have so much to learn about dyeing. I'm glad you had success with this dye removal Peter! I used Rit before and paid a fortune for it as it's not really sold in the UK. I wad removing a dye by a brand called Dylon from some viscose fabric. It was the coolest and most disappointing experience at the same time. 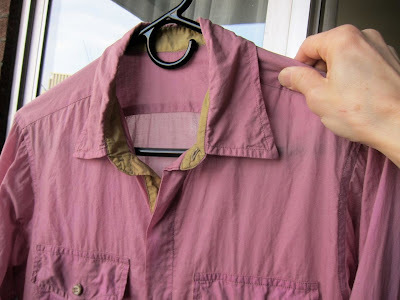 When the fabric was dipped in the remover the colour disappeared. 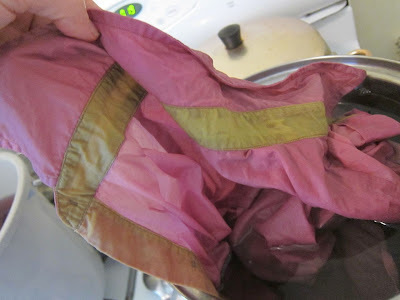 When I pulled the fabric out and it was exposed to the air the colour came back. It was like a cool magic trick, so after a hour of playing now you see the dye, now you don't - I finally gave up and admitted defeat. The dye went nowhere, I was £7 poorer and severely vexed! Miss J, my local fabric shop in SWUK sells Rit dye. 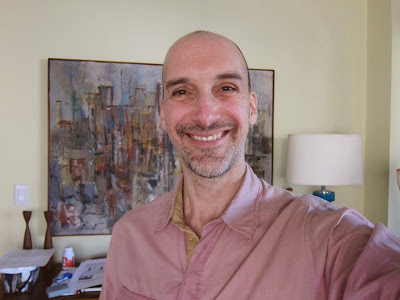 Wow, I really like the color of the plaid shirt now. Interesting how the other shirt kind of swapped colors! "Pale beet": I feel like there's a joke in there somewhere, but I'm struggling to find it. Meant to add, my vote is to keep the plaid shirt as-is and dye the other one. I say what she says. I agree, I like the color of the plaid one now. Love the plaid shirt now that you've removed some of the colour. I used Rit Colour-Remover on jeans when I was a teenager. It can be fun if you want to add some stenciling to fabric too. I have never used the dye remover, so I'm enthralled with your results. It is like a magic trick, only yours worked out so well. And the color swapping between the body and the facing on the solid shirt is.....well, magical. Again I recommend iDye over Rit - it is so much easier to work with and has a much bigger colour range. 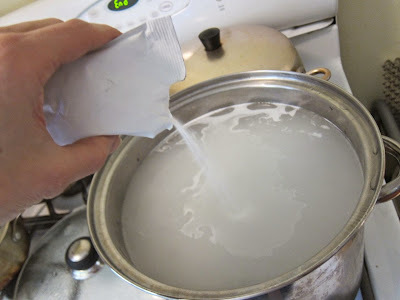 The powder is in a dissolvable packet inside the envelope, you just chuck it into hot water to dissolve it. You can also do it in the washing machine if it s atop loader - from bitter experience I would never dye in a front loader again as the dye gets into the seals and releases itself for months afterwards, no matter how many times it is used and cleaned. Im so greatful for this post. I have some white items that turned a horrid shade of pink when washed with an item I didn't realize wasn't color-fast. They won't fade no matter how many times I wash. I think both shirts are attractive colors now; no further work needed. And thank you for a look at how these products work! What a neat trick! 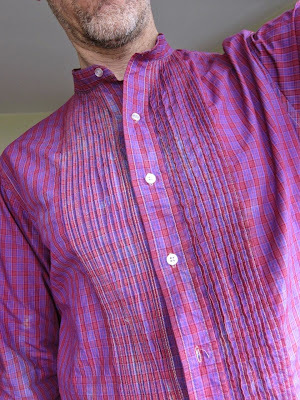 I'm partial to the original plaid shirt, so my vote is to re-dye toward the blue spectrum. From a dye newb, thanks for posting all this. I'm a big fan of natural dyes - madder root, indigo, walnut, cochineal, etc. True indigo dyeing is magical, very fun. Most other natural dyes require a mordant such as alum and tannin for cotton, so an extra step in the process. Maiwa supply in Vancouver, BC is a source I like (and natural dyeing instruction to download), several good sources in the US too. An indigo dye vat would be a good option for your shirts (in my opinion, and if you like blue). Your dye bath event is right out of my playbook. Boy, have I been in some crazy dye messes. Some good, some not so good. If you use Rit dye make sure you either strain the diluted dye or stir until it is completely desolved . 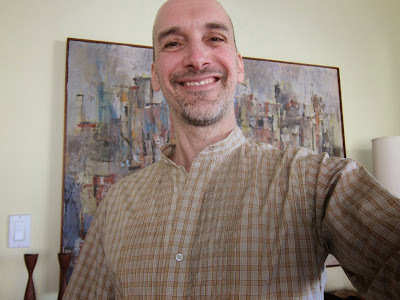 I have gotten little specks of intense dye color on the fabric from undesolved grains of dye. Your shirts look much better already. I dyed a sofa slipcover recently using Rit dyes in my top loading washer. It dyed evenly but faded in the sun. I like the faded color but I have two less faded areas where I had throw pillows. Not sure if sun fading with Rit is typical or not.